This Place Matters: Oklahoma church building featured on National Trust for Historic Preservation website. 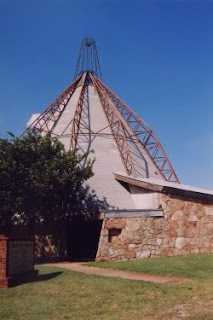 The unusual Hopewell Church in Edmond, OK was designed by Bruce Goff in 1948. Often referred to as the "tepee church," it was completed in 1951, but has sat vacant since 1989. But the National Trust hopes to preserve such iconic structures. You can learn more about the Hopewell Church, or help save it by spreading the word or making a financial contribution through the Trust's Community Challenge.